There are few historical figures that have continually captivated me quite like Marie Antoinette. My first true introduction to the French queen was Sophia Coppola's fabulous film Marie Antoinette, which, granted, was not the most historically accurate, but did a wonderful job of capturing the pastel aesthetic of life as an absolutist monarch living the life in Versailles. It was in middle school history that I learned the true fate of Marie Antoinette, and it really pissed me off to learn that such a chic individual was the target of such loathing and unified hatred. Homegirl was just trying to keep up with the other royals at court and wear the latest in mile-high hair fashions—heck, she was even trying to give everyone in France cake or Laduree macarons or something—and they return the favor by sending her straight up to the guillotine. #Rude. The way it was explained in my history class, Marie Antoinette was a cartoonish villain, doomed for her frivolous ways and the figurehead of a pretty intense smear campaign. With Coppola's vision being a bit too hazy and my history books too simplified and one-sided, I found myself dissatisfied with my knowledge of the life of Marie Antoinette. So I turned to outside reading, first with Caroline Weber's fabulous book Queen of Fashion: What Marie Antoinette Wore to the Revolution, and later Atonia Fraser's Marie Antoinette: The Journey, upon which the Coppola film is based. Antoinette is the one historical figure who I will read whole books about and the first to make me realize how complicated issues of the past are. It's easy to dismiss her as a ditzy princess who focused too much on fashion and not enough on politics, but that's ignoring the fact that her husband was just not suited to be a ruler. More than anything, Antoinette fell victim to an outdated form of government simply by being born into it, and there was nothing she could do to keep the tides of history from changing. Regardless of what you believe her political legacy is, there is no denying that Marie Antoinette was and remains one of the most influential fashion figures of all time. No one could rock panniers and powdered wigs quite the way that she did, and her influence in all things fashion echoed throughout France and Europe. Over two-hundred years later, designers are still constantly inspired by Antoinette. From the pastel-colored hues that Coppola's film made integral to the image of Antoinette to gravity-defying skirts and headwear, there is no denying the staying power of Marie Antoinette's fashion choices. 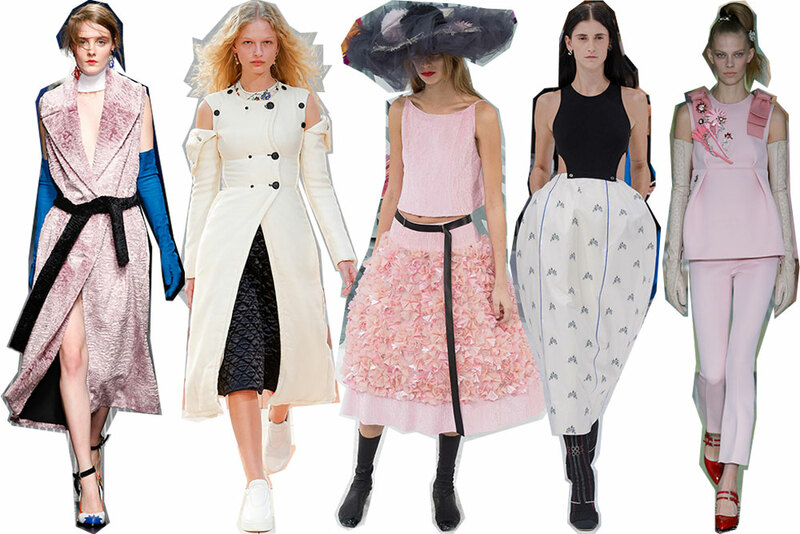 Every other season it feels like brands like Chanel and Dior are drawing from the fashions at Versailles for their collections (in 2013, Karl Lagerfeld even staged a show in the gardens of Versailles). 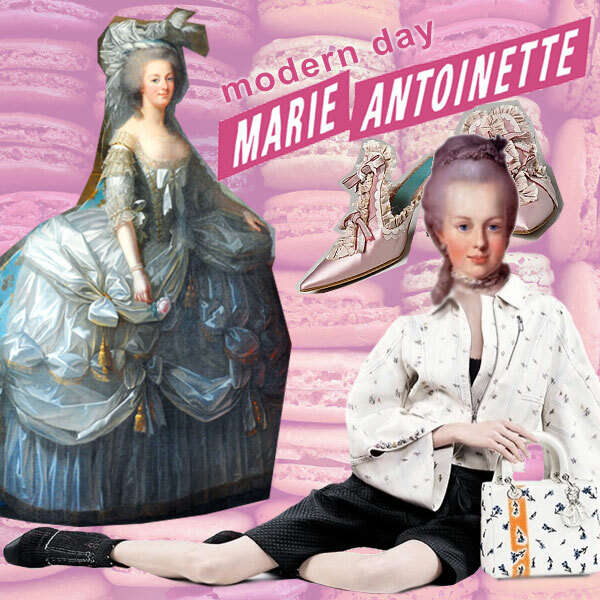 If Marie Antoinette were alive and well today in 2015, what would she be wearing? My guess: decadent brands like Dolce & Gabbana and Valentino mixed with innovative creations from Junya Watanabe and other avant-garde designers that aren't afraid to push the boundaries of fashion. In other words, Marie Antoinette would be a full-on fashion risk-taker. She'd be front row at all the couture shows wearing custom creations, and she would be on the front page of every street style blog stealing the spotlight with her fun headpieces and crazy outfits that would put the likes of Anna Dello Russo to shame. Like the sound of that? 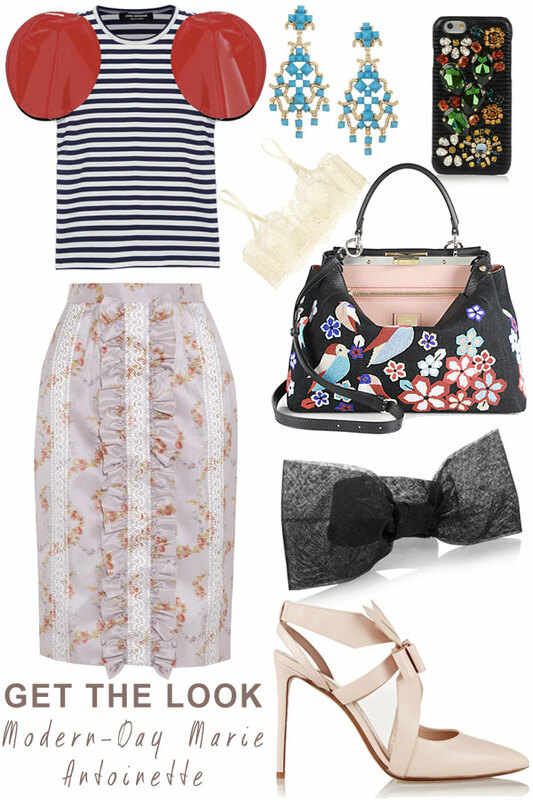 Here's how to get the look of a Modern-day Marie Antoinette for yourself! Through on your most inventive outfit, take a 'gram of you dining on macarons at Bottega Louie (in a Coppola-approved dreamy filter, no less), and live the good life! Just watch out for any unruly citizens looking to take out well-dressed rulers.